One hundred eight Cal 40s were built since they were introduced in 1963 and finished production in 1971, and, at the time, they were considered a radical design. Fifty-five years later they continue to inspire sailors and make themselves known on the race course and the world’s oceans. In our current October issue we wrote about Don Jesberg, who’s renovating hull #103, and just last weekend nine Bay Area Cal 40s gathered at the Encinal Yacht Club for a local reunion. 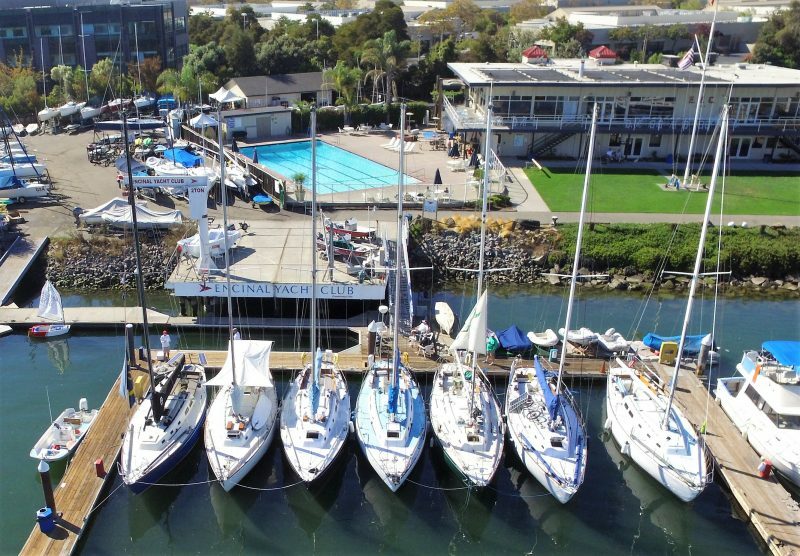 Rodney Pimentel sent in this photo of seven of the nine attending Cal 40s lined up at Encinal Yacht Club. 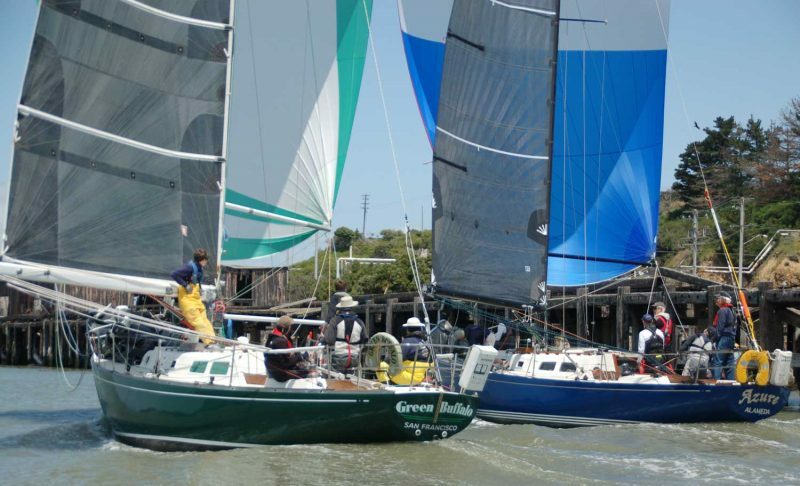 Jim Quanci’s Green Buffalo and Rodney Pimentel’s Azure in the Great Vallejo Race, still looking good and still great for racing. Sixty-nine boats have entered the upcoming 2019 50th running of the legendary Transpac race to Hawaii. Right now, the Cal 40 class is the largest one-design class in the event, and it’s likely to stay that way! Just a few hours after we published a story on Monday about our love for the low-tech autopilot, we were at San Pablo Yacht Club when we met a gentleman who had just read the piece. “Let me show you my autopilot,” he said (we didn’t get the gentleman’s name with enough confidence to publish it here; if you’re reading this, please email us, and we’ll update this story). An “autopilot” can take on many forms. 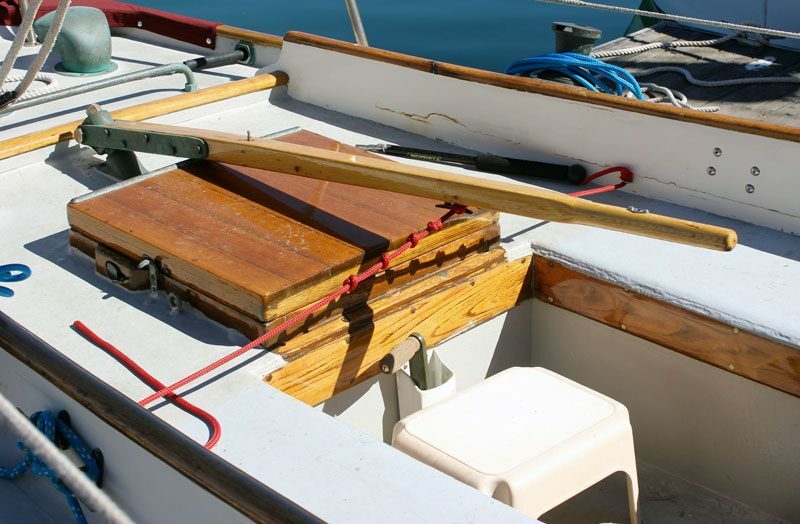 On this Myron Spaulding-designed boat, a line with a series of knots is fixed to a cleat on the tiller, allowing for fine-tune adjustments. This was the first of several ingenious systems we’ve seen. 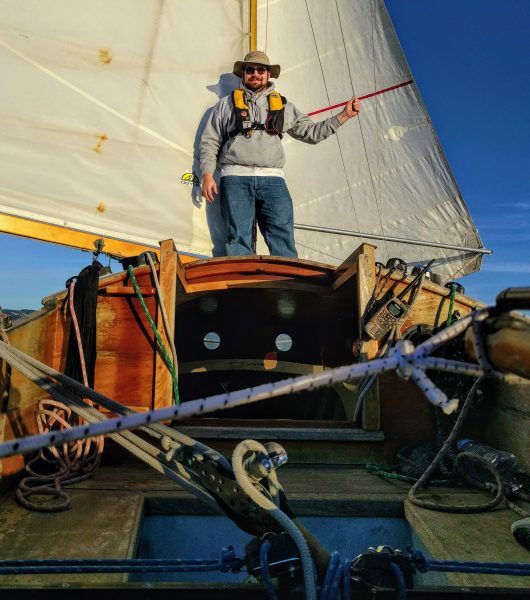 Luc McSweeney — who we’re going to feature in an upcoming issue of Latitude — showed us two steering-assist methods for his 60-ish-ft pinky schooner Tiger. 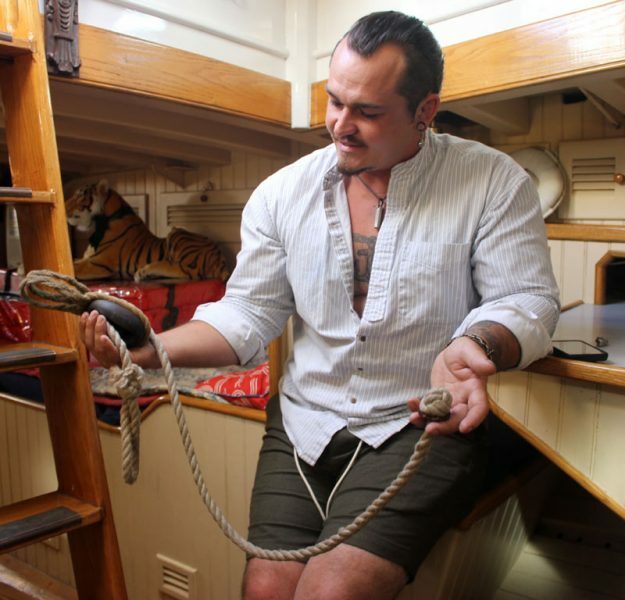 The first was a “whip,” or a set of tackle with a loose line that gives purchase on the tiller, something that’s advantageous on a boat like Tiger. 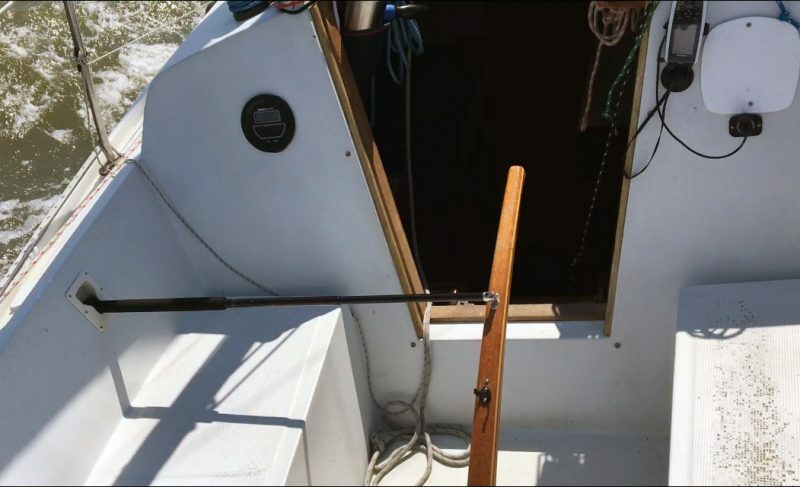 Luc McSweeney shows us the “whip,” a type of steering assist for a traditional vessel with a monstrously large rudder. With its 2:1 purchase, this “steering assist” (our term) takes some force off the tiller, and allows the skipper to sit more outboard on the vessel while helming. 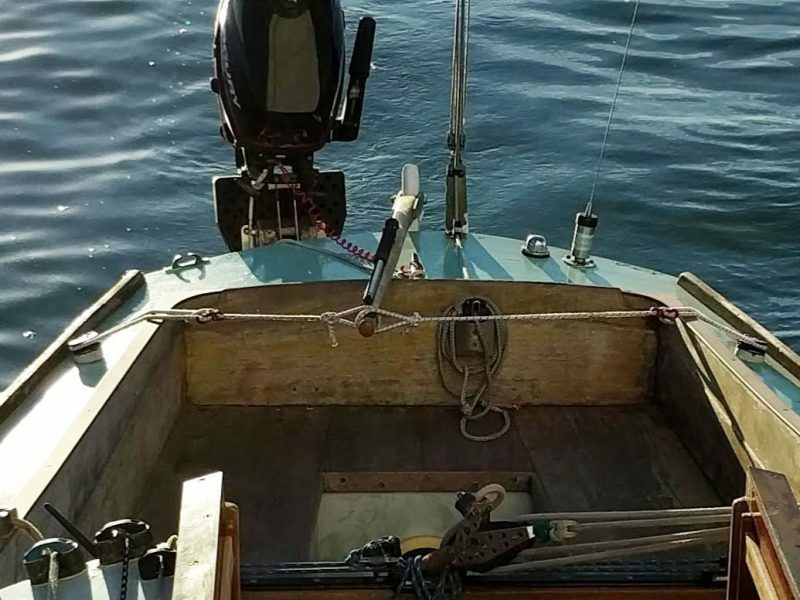 Driving a 60-ft wooden boat with just one line? It’s actually easier than it looks, according to Tiger’s skipper. McSweeney also had a full-on “autopilot” (the pictures of which came out too blurry for publication), which was built from an elasticky line running through a series of blocks. When attached to two fixed points opposite the tiller, the system offered smooth, controlled steering, according to McSweeney — he showed us video of him singlehanding Tiger in 30 knots of breeze. But this was just the start of the responses we got. “I use bungee cords on the tiller. And yes, it gives me goosebumps just thinking about hands-off sailing, Joshua Slocum style,” wrote Ken Brinkley from Portland, Oregon, about his Cal 29 MkII Rumblefish. Brinkley commented on the feeling of freedom when you can take your hands off the tiller, and watch your boat sail on its own. 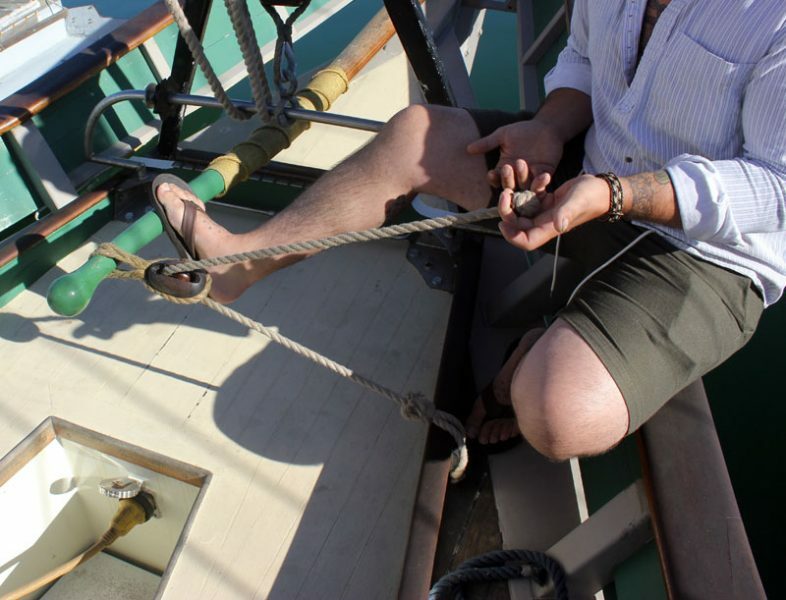 Once the steering is taken care of, you get a new perspective on your boat. Josh Ott, enjoying his autopilot. Grant Kiba said that he has a tiller extension with a “locking pocket” on his Ericson 27 Take 5. The non-bungee or line low-tech autopilot. 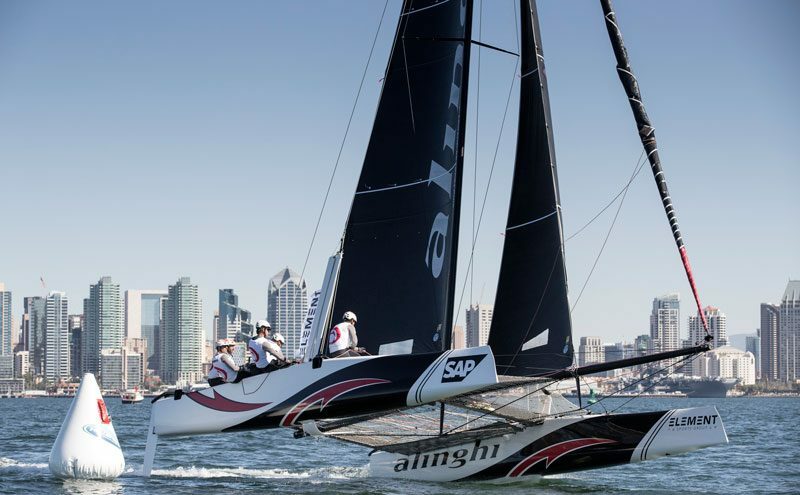 Alinghi flies a hull in San Diego during this week’s Extreme Sailing Series stopover. 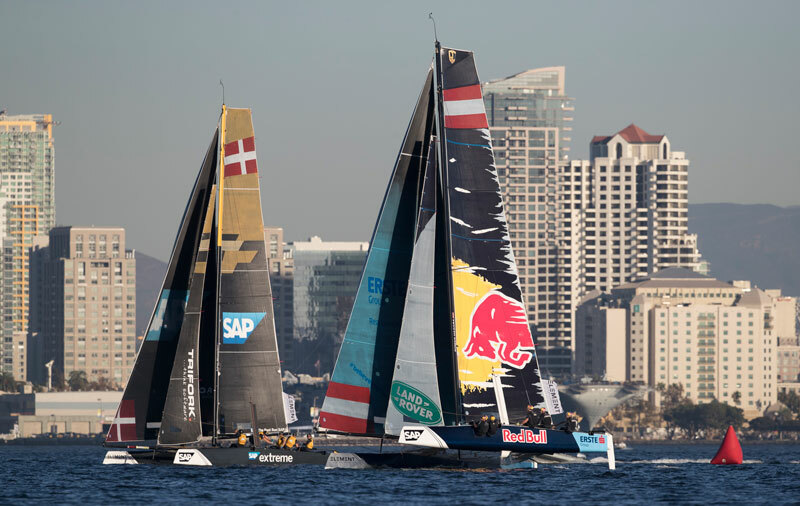 Like last year, the GC32 catamarans of the Extreme Sailing Series have come to San Diego for some high-level stadium-style racing. And also like last year, an American team has joined the small fleet. The Element Spark Compass crew consists of US match racing champion Taylor Canfield, Sam Hallowell, John Wallace, Matt Noble and Mateo Vargas. 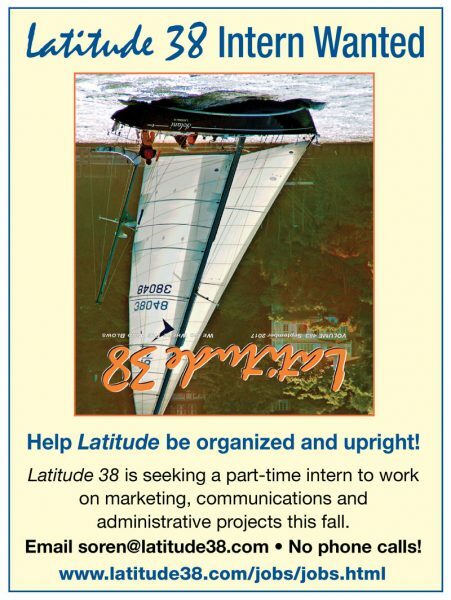 Matt Noble is a scion of the Richmond Yacht Club junior sailing program. Fellow Californian Mateo Vargas, a Laser champion, sailed for Stanford. John Craig, former racing manager of St. Francis Yacht Club and the PRO of America’s Cup 34 in San Francisco, is serving as PRO in San Diego. The new American team on her home waters. An extensive race village is set up on Harbor Island for spectators, and admission is free. Can’t get to San Diego or get away from the office to watch in person? There’s an app for that (find it here). A race village is set up on Harbor Island, with lots of activities for spectators to enjoy. In addition to the GC32 racing, there’s an Element Sports Kite Boarding Invitational, O’pen BIC youth sailing and Go SeaQuest on-the-water simulators. Racing was off to a slow start yesterday, as the breeze played hard to get. John Craig postponed until 3 p.m. He extended the deadline and got in six races. 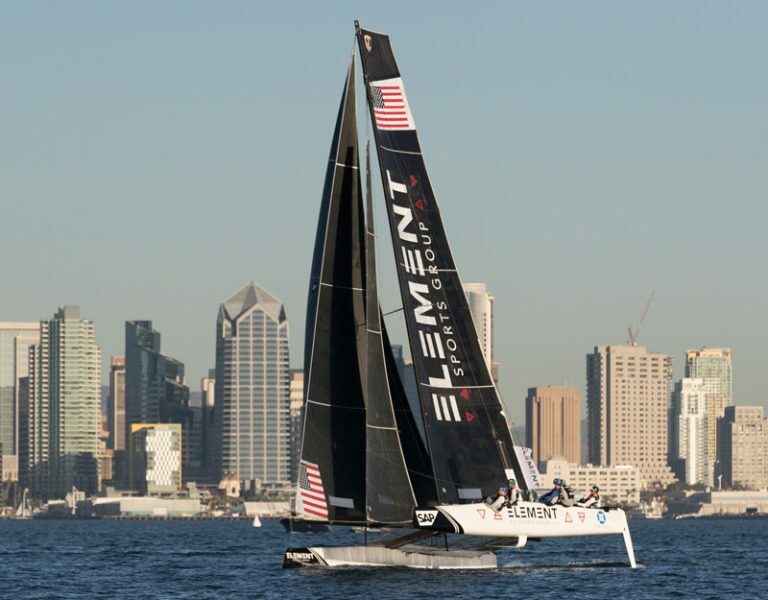 Series frontrunners Alinghi took four wins to lead the San Diego Act. The event continues through Sunday. Far from “extreme,” light breeze and lots of sunshine dominated the conditions yesterday. 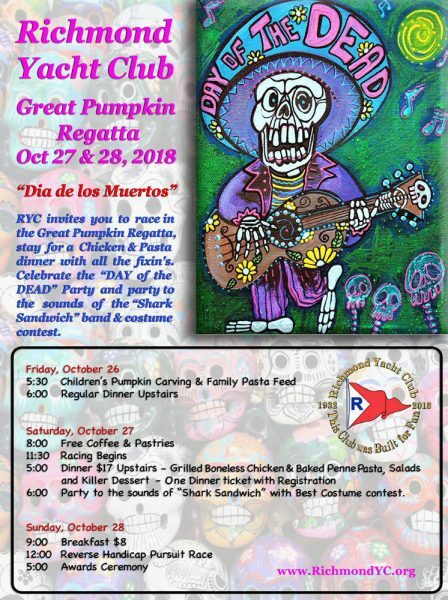 Los Cabos will host the final Act on November 29-December 2, and a Mexican team has also joined the fleet for these last two events of the series. Get caught up with the Extreme Sailing Series at www.extremesailingseries.com.